For those who haven’t subscribed to the Gauche Alchemy monthly newsletter (and just why not? ), I’m thrilled to get to share a project I’ve had to keep close to the vest for more than a month! I know, the suspense was killing me, too–I hate keeping fun stuff from you guys. Even if you did see the project in the newsletter, I’ll be showing step-by-step photos of the process, so it’s worth a peek if you’re curious how I put these awesome Paper Brooches together. If you recall my altered make-up box, I used Â theÂ Intricate Design stampÂ for the faux-hinges and I believe I mentioned that Â I’d had other plans for that stamp to begin with. This is what I had in mind when I ordered that stamp. 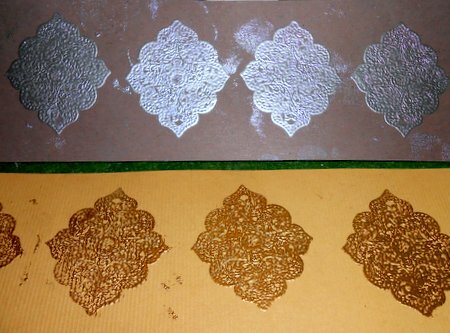 I antiqued the embossing with some metallic rub-ons, applied with a cotton swab. punched a few strategic holes (3 sets along the bottom for the horizontal brooch, one on each side and at the bottom for the vertical) with a 1/8″ hole punch. 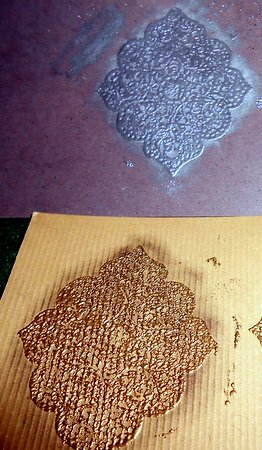 After that it was time to fussy cut the images, leaving little circles around the punched holes. 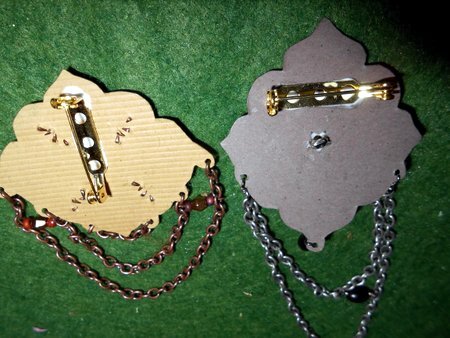 I cut different lengths of jewelry chain and used needle-nose and round-nose pliers to open the links, slip them into their holes, and close them back up. 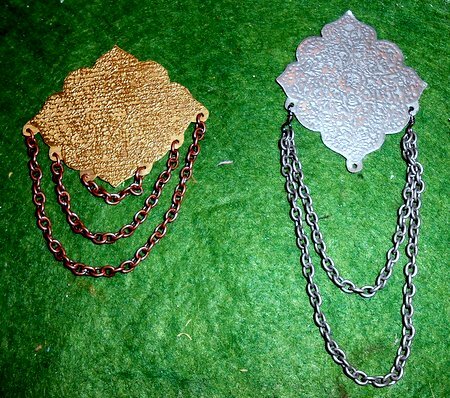 (You could also use jump rings–much easier if you’re stringing multiple chains together, like I did with the silver brooch). After that it was all about the decorations. 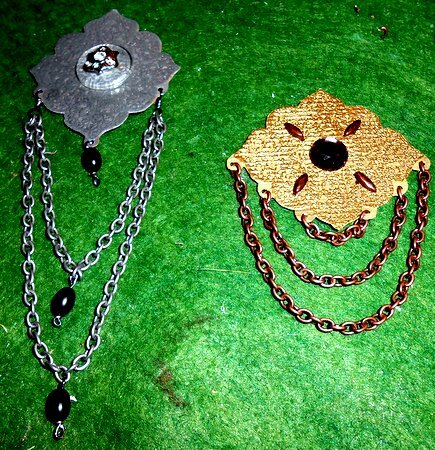 The beads for the silver brooch came from theÂ Black Out mixed media color kit, while the flat-backed gem and coppery brads for the gold brooch came from theÂ It’s All Gravy Baby brown color kit. Also on the silver brooch is a Tim Holtz button (I punched a hole in the center of the paper background to allow for the shank and used clear glue to secure it to the front). 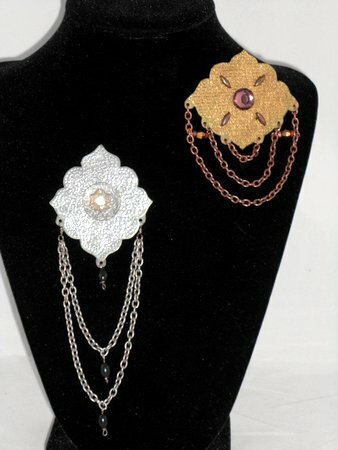 To help the chains on the gold brooch hang correctly, I added a beaded spacer bar between the 2 outer sets–the gold-tone bi-cones added a little sparkle while also serving a purpose. All that was left was to add the pin-backs and let them dry. On my next go-round–because I do plan on making more– I think I’ll reinforce the back of the pin with another layer or two of card stock, just to make sure the brooch can stand up to lots of wear. (Probably only necessary if you’re a klutz, like me!) 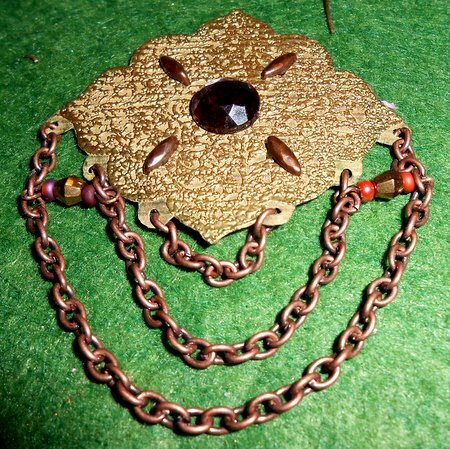 The gold/coppery brooch went to a friend as a birthday gift and was very well received, the silver one I plan to keep for myself. Pingback: Scraps of Life–the 64 Arts » Wrap It Up!